Many Sydney motorists and radio listeners may have taken the wayward Queensland truck driver known as ‘Smokey’ to their hearts but his travails may yet cost him and his company a great deal in fines. The driver was delivering a large boat from Queensland south of the harbour this week but got into difficulties, having to be assisted by authorities and becoming something of a talk-back radio celebrity in the process. Freight Minister Duncan Gay extended the truck’s travel permit to enable the boat to be delivered and the truck to return. 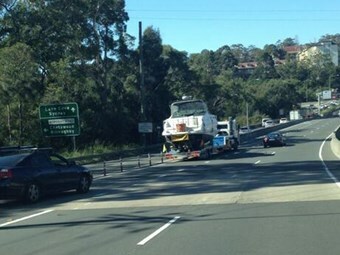 Now Roads and Maritime Services (RMS) has started an investigation into breaches by the Queensland-registered truck he was driving for being over-height, off route and for disobeying a low clearance sign at the Lane Cove Tunnel, it says. The heavy vehicle stopped and reversed after height detectors and warning signs were activated on approach to the tunnel. The truck then continued to the Sydney Harbour Tunnel, where height detectors were again activated and the truck stopped on the red signal without entering the tunnel. RMS "will consider sanctions against the Queensland registered heavy vehicle which may lead to its visiting rights being withdrawn for up to three months", the authority says. While no damage was done to the tunnels, Gay has often highlighted a stern policy towards tunnel strikes or other actions that impede the city’s huge traffic load. Meanwhile, the Minister’s office urges the industry to use the trip planning tool on the RMS website rather than risk hefty fines.